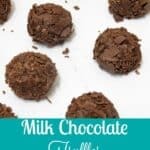 Lately, I have been loving chocolate truffles as a special treat. The only problem is how expensive they are when you buy them at the store. 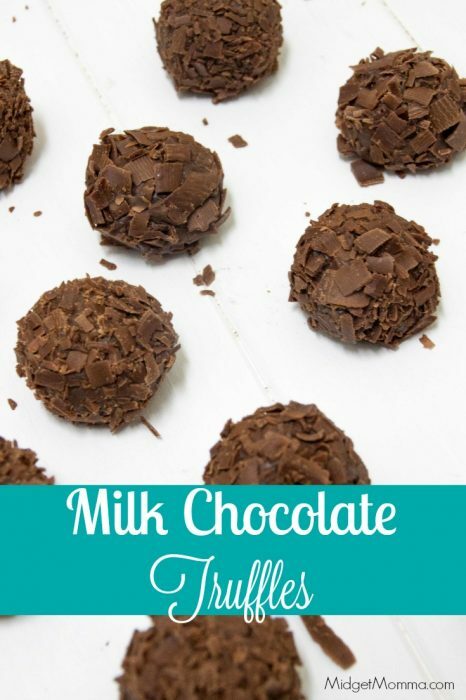 These Milk Chocolate Truffles are by far one of the the simplest candy you can make. There is no worrying about tempering chocolate or cooking sugar to the right temperature, it’s the matter of just following the directions that I provided for you. 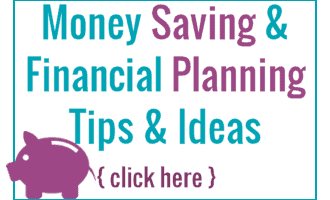 Which are SUPER easy! You will be an AMAZING Milk Chocolate Truffle maker in no time flat! These are so simple to make that my daughter loves to get her hands dirty and make them with me. Her truffles may not look as perfect as mine but she still enjoys it. Now you can roll your truffles in many of different options. 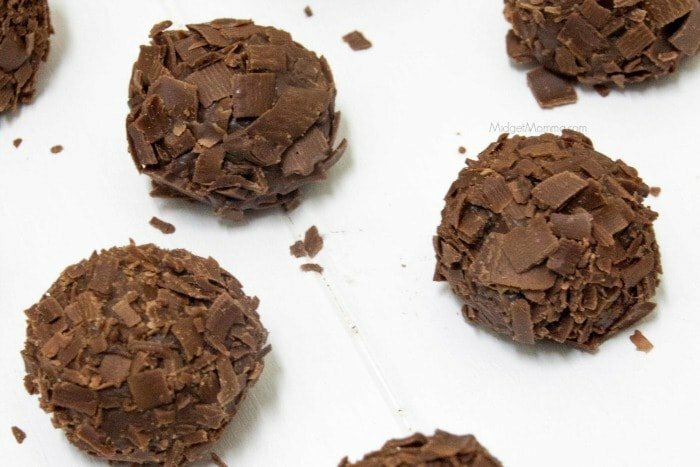 The classic chocolate truffle is rolled in cocoa powder but it tends to have a very bitter taste. If you can find sweetened Cocoa powder then it’s not as bitter. For these truffles, I want something to complement the flavor of the actual truffle. That’s why I just make chocolate shavings using the same chocolate that I used for the inside of the chocolate truffle. If you are looking for THE BEST mixing bowls These with the rubber bottoms are my favorite! For making your Milk Chocolate truffles you will need a veggie peeler – I know I know it sounds crazy but trust me! I have the red kitchen aid peeler and I LOVE it. I have had it for YEARS and it still works just as good as it did when I got it! Also it os important when you are doing chocolate making like this that you have a good set of spatulas like these here. You will also need a cookie scoop– If you do not have one of these in your kitchen you NEED one! Seriously when making cookies and chocolates it makes life sooooo much easier! Place your 10oz of chocolate in a large heatproof bowl. In a medium saucepan over medium-high heat combined the heavy cream, butter, and instant coffee. Make sure to watch the pot so the cream doesn’t boil over. Once it has come to a boil remove it from the heat. Pour the hot cream mixture evenly over the chocolate and cover the bowl with saran wrap. Allow the chocolate to melt about 3 to 5 minutes. With a rubber spatula start by stirring small circles in the center of the bowl to slowly emulsify the cream and chocolate together. As the mixture comes together you can slowly move the spatula out wider until all of the cream is integrated with the chocolate. Pour the chocolate into a 9 x 9 baking pan, cover and place it in the fridge for an hour until the chocolate mixture has set up. Using a vegetable peeler make long peels on the side of the 8oz bar of chocolate to create chocolate curls. Take a small cookie scoop or teaspoon and scoop out small balls of the chocolate. Roll the balls in your hand to make them and an even circle. In a small bowl place your chocolate curls. Add the chocolate balls a few at a time into the chocolate curls and swirl the balls around until they are evenly coated. Remove them from powder set them on a plate. Refrigerate for an hour and enjoy. In a medium saucepan over medium-high heat combined the heavy cream, butter, and instant coffee. Make sure to watch the pot so the cream doesn't boil over. Once it has come to a boil remove it from the heat.